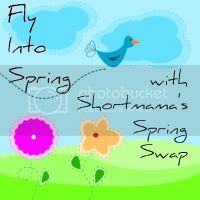 Awhile back, I signed up for a spring swap at Family of Shorts, and I had so much fun shopping for Dysfunctional Mom, but as usual, I was a little late mailing out my package to her. So I rationalized that a day late wasn't too bad, because she lives in the same state, but I worried that she would be upset that it wasn't mailed on time. But, don't worry be happy dodododododo don't worry because she e-mailed me to say that she mailed her's out just as late! What a relief! Today, I returned from vacation to find this pretty little package. There's my all time favorite pens, in my favorite color. A really cool keychain with stars on it (my favorite shape.) Some really fabulous pins with rock n roll tattoo stylings Rock and roll hoochiecoo (I can't wait to pin these on my bag.) I love skulls, so, she got me some skull bling to embellish something with, now to decide what to put it on. A really pretty Starbucks giftcard with a little red bird on it. And, as her note says every blogger needs a journal. This one's really cool because it has pockets to throw little notes in. So, if you're looking for me, I'll be at Starbucks, drinking a macchiato, listening to some tunes, writing in my new journal with my favorite purple pens. You so totally outdid yourself with my package that I feel LAME! I think I shortchanged you! Oh, DysFUNctional Mom did a really nice job :) You two were wonderful swap partners. That's always so nice to see. wow you two were great swap partners! !